To remove rust from tools, combine salt and lemon juice in a container, then rub the solution on using steel wool or a scourging pad. 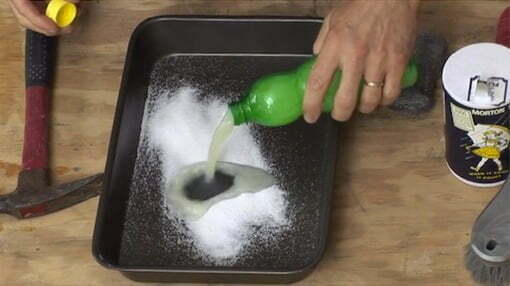 The salt acts as an abrasive while the acid in the lemon juice cuts through the corrosion. For heavily rusted tools, allow the solution to remain on the surface for a few minutes first. Once the corrosion has been removed, wipe the tool clean with a dry rag. Can’t wait to try it. I have a lot of my Fathers old tools that I want to bring back to Life. Thank you for the simple tip. We recommend using lemon juice, but people have used vinegar as an effective rust remover. Can you use vinegar in place of the lemon juice? Results may vary, so you can start with half and half, as Joe did, and experiment from there. How much vinegar and how much salt? Can I just mix up the lime and salt in an aluminum cooking tray, add the tools, and just let them soak?